Although this easy kale chip recipe has no cheese and is not fried, it will turn Cheetos into a ghetto snack of the past. This vegan raw recipe for Cheesy Kale Chips has been perfected from countless attempts to create the crunch of the best bagged kale chips at Whole Foods without throwing down $8.99 a bag. Let’s face it cheesy kale chips are addictive enough to get you hooked at that price, but YIKES!- what a pain in the wallet. Rinse the kale and spin dry. Remove the stems and tear into bite size pieces. Let the kale air out as much as possible before coating. Blend the ingredients for the cheesy seasoning in the Vita-Mix until smooth. Transfer kale and seasoning to a large bowl and mix well using your hands to ensure the leaves are well coated. 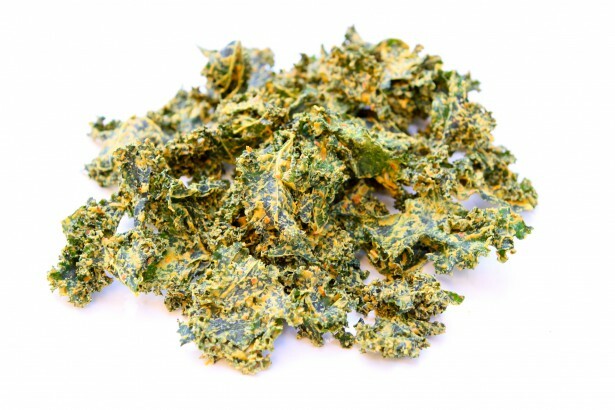 Place the kale on the dehydrator trays, the Excalibur Dehydrator is by far the best on the market). Dehydrate at 118 degrees overnight or until coating is dry. Slide onto mesh screens and dehydrate until totally crispy. Note that not all nutritional yeast is vegan, so READ the label! Bragg’s is vegan and I love the flavor it offers. TIP for keeping Kale Chips Crunchy. Take a small fabric bag, sachets for jewelry or aromatics work well, and fill it with uncooked rice. Place the it in an airtight glass container with a lid and seal up the kale chips. The rice soaks up any extra moisture in the container, keeping your kale chips crunchy for days! Was wondering where the ranch recipe can be located? I am super excited to try out my new dehydrator with the cheesy chips! Holy Crap! These are THE BEST kale chips I’ve ever had. I modified your recipe a bit to suit my own tastes. I left out the bell peppers, used Coconut Sugar instead of agave and traded lime juice for lemon. I added some shichimi togarashi for spiciness and color instead of turmeric and added a couple of cloves of garlic instead of onion powder. I’m not certain what the fuss is about keeping the kale chips since even with all 9 trays of my Excalibur dehydrator filled to the margins with kale, they won’t last more than a day or two around this house! How many hours did you dehydrate the kale chips at 118 degrees? Holy Kale-RITOS, Batman!! (Credit to Travis Houston for posting that moniker.) These are downright sinful!! Where am I gonna hide these delicious little crisps from my husband so I can selfishly scarf them all down?! Thank you, thank you, THANK YOU for this recipe!!! I’m on the Engine 2 Diet, and this recipe is E-2 approved! (No animal products whatsoever, and absolutely no added oil.) I also was quite tired of shelling out nearly $7 a bag for a mere TWO OUNCES of kale chips! Seriously?! Why in the world are they so expensive when kale is one of the cheapest vegetables you can buy?! The next batch will have some kind of pureed heat added to the blended sauce (fresh jalapenos, serranoes, whatever), because we like HEAT here in Texas. (I might cut the red bell pepper in half, and toss in some Anaheim chilies?) Kudos to Sabine, who posted here that they added chili and paprika to their last batch. We are very lucky to have a lot of health-conscious purveyors of food here in Austin. (I joke that Austin is one big bowl of granola in the middle of a red state!) 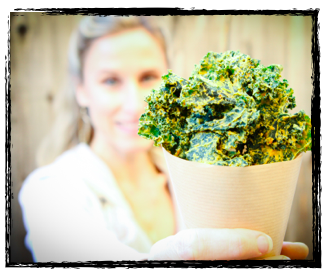 One of my favorite foodie places here is Juiceland, a juice bar which makes a similarly sinful kale chip. Their kale chips have a slow after-burn that is pure zen for spice-aholics. Can’t live without it. I don’t have an Excalibur dehydrator (it’s next on my wish list), but I do have a Nesco “American Harvest” dehydrator (Model # FD-61, 500 watts). It has the heating element on the top of the machine (no cleaning gunk out of a bottom heating element each time you use it). I know it’s not top of the line, but it works great and turned out this recipe perfectly. Each round tray is about 13 inches in diameter. I also haven’t fired up my late Mom’s VitaMix (it needs a good cleaning), but my garden variety blender worked just fine for pureeing the sauce that coats the kale. I also like the idea of subbing lime juice for lemon juice – will try that next time, since I’m famous for veering waaay off topic when I find a recipe. Will also try adding fresh garlic to the seasoning – love that stuff. Prep tip for most vegetables: Due to my work, I’m in many restaurant kitchens every day, and I get to watch the kitchen staff in action. One of the things which impressed me early on is how most all kitchens soak their lettuce/veggies in cold water for about 5 or 10 minutes before rinsing them. If you think about it, it’s the best way to soften dirt and rid lettuce/veggies of minute debris, such as tiny pebbles and other weird stuff before running them through a colander or centrifugal system (salad spinner). So right before making a veggie dish, I soak in cold water most every vegetable which comes into my kitchen, especially curly kale, which has so many hiding places. I would also love to have the nutritional breakdown for these kale chips! It must be stellar, since very few nutrients are lost in the dehydrator. Finally, be VERY careful before you add ranch dressing to this recipe if you are concerned about your health, or that of your family. Aside from the cancer-causing casein in dairy (read Dr. T Colin Campbell’s “The China Study”), popular brands of ranch dressing can contain some n-a-s-t-y additives and preservatives. Look at the ingredients: If we can’t pronounce it, we shouldn’t be eating it. Also, I thought to keep it raw, the temperature cannot go above 115. Am I wrong? I don’t have a dehydrator could I make these in the oven? Why put agave in them! I omitted and they are great, you don’t need sugar for these! The first batch I made was gone right away so I tripled it the next day!!! Love love love! I am looking for a substitute for the cashews….they are a little expensive. Anybody have any ideas?? I am looking for ideas to substitute for the cashews….they are a little expensive and I think I have a nut allergy. Does anybody have any better cost effective ideas?? Raw sunflower seeds! I use them for every recipe that calls for cashews. Works great, way cheaper, and still super nutritious! Hi Joy, can we refrain from using terms such as “ghetto”… Veganism is white centered enough as it is and we don’t need any more classist rhetoric in our community.